There are several hydroponic systems. The aeroponic system is the most technical of them all. Still, the system is fairly easy to understand and set up. The aeroponic systems are known for delivering good results, therefore a lot of home growers prefer using this type of system. Aeroponic systems, after all, are hydroponic systems so they can be built at home using different materials. There are different types of custom designs to try as well. Aeroponic systems are highly space efficient and are thus suitable for limited growth areas. The biggest advantage to the aeroponic system is that these systems use little to no growth medium. Therefore, the roots are allowed to receive as much oxygen as possible, so the plants grow really quickly. Aeroponic systems also use the least amount of water compared to all other hydroponic systems. Harvesting from aeroponic systems are also considered to be easier. As for downsides, aeroponic systems are somewhat expensive to build because there are many parts involved. The systems require regular maintenance. The sprinkler or the mister in aeroponic systems tends to get clogged due to mineral buildup if not taken good care of. By design of these systems, the roots of the plants will be hanging in mid air. So the roots are very sensitive to water flow and can dry up and die with even the slightest interruption. Growers should be careful to make sure that the system if not interrupted by things like power outages. Aeroponic systems allow plant roots to hand in mid air, which allows for maximum exposure to oxygen. The more oxygen the baby plants get, the faster they will grow. The period between seeding and harvest is quite short when using these types of systems. The plants are placed in small baskets or inside foam plugs that secure the stem in place. Then these baskets or plugs are fitted to small holes atop the growth chamber. This allows the roots to grow hanging down. 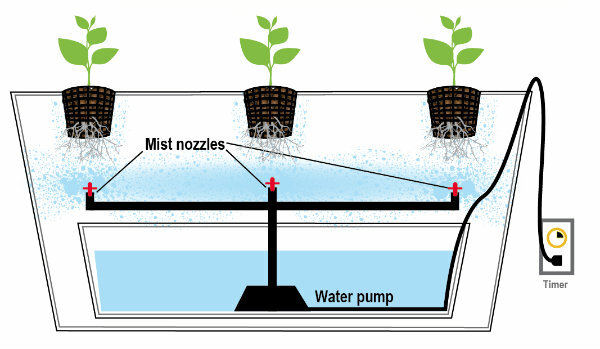 The system uses a mister or a sprinkler to spray the roots with nutrients during regular periods. A well-timed watering system keeps the roots from drying out. The growing chamber in the aeroponic system should be air tight and light proof. There are several reasons for this. An open system would cause pest invasions, and also result in precious water from spilling out. Also, too much air flow will prevent the root system from sustaining an ideal level of humidity. The roots should get maximum amounts of oxygen, moisture, and nutrients in an enclosed system. A well designed aeroponic system will deliver all three in ideal amounts while minimizing the risks for pests and spillage. It should be noted that the water droplet size matters a lot to an aeroponic system. The roots must receive very fine mist to grow larger rapidly. Fine mist has more surface area so the roots can optimally absorb water and nutrients. Fat droplets don’t allow this advantage and may even dampen the roots. Water droplet size is a major characteristic of any aeroponic system. Low-pressure aeroponic systems are the most commonly used, and also most commonly sold at stores. Low-pressure systems work well and have large water droplet sizes compared to high-pressure versions. The low-pressure aeroponic systems, compared to high-pressure ones, are relatively cheap to make. While aeroponic systems, in general, involve a lot of technicalities, the low-pressure version is simple in design and easy to understand. Therefore, home growers quite prefer low-pressure aeroponic systems. A soakaponic system can be built easily at home because growers won’t need to buy special water pumps or any other specialist equipment. You can use a standard pond or fountain pump for the system. However, it’s recommended to use a sturdier pump than what’s typically used in other hydroponic systems. The pressure in the pump determines how fine the sprinkler mist will be. Also, the more sprinklers you add to the system, the less pressure there will be per sprinkler. Regular fountain or pond pumps do not come with a pressure rating. But you can determine the strength by checking the gallons per hour, or GPH, rating. The more GPH a pump has, the better it will be for an aeroponic system. Growers will need to buy as many sprinkler heads as possible to entirely cover all the roots. Keep in mind that the root zone will get bigger as the plants grow larger. It’s difficult for sprinkler heads to shoot mist that penetrates the root mass of mature plants. Therefore, the sprinklers should be placed above the roots near the top of the zone. In this manner, when the sprinklers spray mist, the droplets will trickle down through the mass and get absorbed without going to waste. When you sprinkle from the bottom to the top, gravity will pull down unabsorbed droplets leading to a lot of spillage. First, you will need a reservoir or a container to hold the nutrient system. You can use any useful item, like a bucket or a bottle, that can hold liquid. You will need a fountain or a pond pump as specified above that can be submerged in water. These systems deliver water from the pump to the sprinklers or misters with a system of tubing that fits inside the growth chamber. The root zone of the growth chamber requires an enclosure. You will need mister or sprinkler heads as well, and get as many as possible. Additional items the system needs include a water-tight container for the growth chamber, tubing to remove excess solution, and a timer for the pump. There are three types of aeroponic systems. This article will focus on high pressure aeroponic systems. High pressure aeroponic systems are commonly called “true” aeroponic systems. Low pressure systems are more common due to low cost and ease of assembly. But only high pressure systems deliver the fine mists that truly define aeroponic systems. High pressure aeroponic systems can deliver water mists at pressures ranging from 60 to 90 psi, which is a very fine mist with small droplet sizes and high surface areas. This is the type of mist that delivers optimal amounts of oxygen and nutrients to the root system. High pressure systems, naturally, let in more oxygen than with low pressure systems. While ideal, building a high pressure aeroponic system is rather complicated and expensive. Therefore, only the most serious and experienced growers utilize this type of aeroponic system. Growers will need to invest in several numbers of expensive items to build a true high pressure aeroponic system. These types of systems require a pressurized reservoir tank, so you will need to buy an accumulator tank. A small air compressor is needed to pressurize the accumulator tray. You will need sprinklers or mister heads that can deliver fine spray. The mister heads will be connected to feeding tubes and controlled by Solenoid valves. The valves will require cycle timers to control overall delivery of the solution. The root zones need an enclosed growing chamber. Then, an additional reservoir will be needed to collect runoff or spillage and recirculate it back through the main system. The basic concepts of design for high pressure aeroponic systems are pretty much the same as for the low pressure ones. However, the nutrient and water delivery system is significantly different. Unlike with the low pressure system, the high pressure system requires a pump to be turned on and off on a timed basis. Typically, the time is calculated based on how many hundred or thousand times per day the pump works. This is a delicate timed system that could wear out easily when not configured properly. The typical pond water pump is not used in high pressure aeroponic systems. Because the water pump is eliminated, the water reservoir in high pressure systems is pressurized. The accumulator tank used in true aeroponic systems is similar to the tanks used in reverse osmosis water systems. Regardless of the hefty name, the tank is a simple container with a rubber diaphragm, or a divider, at the center that separates the reservoir into two sides. One side contains the nutrient solution, and the other side contains the compressed air. The air is compressed to about 60 to 90 psi pressure levels (hence the “high pressure” name). This level of pressure pushes against the central divider until the nutrient solution also reaches similar pressure levels. This pressure drives the solution through the tubes to the mister heads in the growth chamber. The tubes are opened or closed using Solenoid valves. A cycle timer determines when the valves should be opened or closed. The timing set by the grower’s preferences. The valves are typically opened for a few seconds and closed for several minutes. The cycle timer keeps the system on an on/off cycle of misting all day long. Both aeroponic and hydroponic growing methods are perfect to raise plants without dirt. Both methods are known to be efficient and yield results the way growers expect. Aeroponics is technically a sub category of hydroponics, but some people seem to think of the two systems as distinct. Considering that both methods are so popular, could one method be inherently more superior to the other? In a hydroponic system, the soil is replaced with a growth medium. Typically, this growth medium is a foam that has the ability to retain and transport more water than soil. Water delivers nutrients the plants need to the foam, which it absorbs. Then the plants absorb the nutrients through the foam. Aeroponic growth systems work very similarly to hydroponic systems. Except that instead of having absorbent foam, the system uses a liquid nutrient solution that is delivered directly to the root system of the plants. Aeroponic systems sprinkle or mist nutrient solutions to the roots of the plants, which are grown suspended mid air in these systems. Plants are grown vertically. The advantage here is that the mist is easy to absorb for the plants, so the seeds mature quickly. So is one system more superior than the other? It’s not a question that can be readily answered. Both systems offer many benefits to growers. Both systems have their own drawbacks too. Generally speaking, both systems are considered to be more convenient than a soil-based growth system. Growers can enjoy a lot more flexibility and control with the two systems than with soil. Some growers, however, seem to prefer aeroponic systems to hydroponics because these systems are a lot easier to set up. An aeroponic system can be built using everyday junk you can find in a typical garage. Equipment for aeroponic systems can also be easily found at regular hardware or home equipment stores. On the other hand, some hydroponic systems require placing special orders for some equipment. Additionally, hydroponic systems require more space than aeroponic systems. Hydroponic growth areas are also really heavy. While this won’t matter to professional farmers, home growers may prefer lightweight and space efficient aeroponic systems. Aeroponic systems also allow for plants to be easily transplanted. Aeroponic plants are much less likely to suffer from transplant shock. This gives growers more options for moving plants around, especially if male and female plants need to be separated. Plants in aeroponic systems are also more visible. The root system can be observed easily without causing damage or disturbance. Growers can adjust the nutrient mixed accordingly when they can clearly see how the plants are growing. Also, if the plants are experiencing growth issues, growers can spot the problems early and start treatment in an aeroponic system than a hydroponic system. Hydroponic systems, on the other hand, are probably better for plants that tend to grow big. Aeroponic systems are commonly used with smaller plants, like baby greens. Aeroponics offer more flexibility and precision for cultivating. In any case, both systems are DIY friendly and suitable for commercial growing as well. Plus, both systems are a better option anytime over a soil-based system.